Breakfast! It’s Good for You! It is said that breakfast is an important part of your day, and I have found this to be true. Making a few minutes every morning for food to get your day started has a lot of potential benefits. There’s a lot of research out there on the effects of a nutritionally balanced morning meal (whenever your relative morning may be), though even a simple glass of orange juice can get your motor running more effectively than an empty stomach. Your metabolic rate will get a boost if you wake your system up with some breakfast. This not only gets your fat-burning potential revved up, but can energize your whole system. Your body and brain can benefit from the boost. They should me more energized and active all during the day. Your heart, the central motor of your circulatory system, will likely thank you. Breakfast may assist in reducing the risk of a number of heart disease risks, such as high blood pressure, high cholesterol, and diabetes. Cognitive function can be difficult to maintain if you are being distracted by a cramping or growling stomach. Higher protein foods can help your stomach remain satisfied, which in turn tends to keep down overeating later in the day. Your mood is another factor that breakfast can help with. Starting your day on an empty stomach can make you cranky, especially if you are a coffee drinker. Adding food to your morning can help keep you on a even keel. Even a cup of yogurt can help, and add 1 of the 3 recommended servings of dairy to your daily intake. Breakfast doesn’t always have to be super healthy granola and berries, either. As the start to your day, it can be a wide rage of tasty things depending on your dietary requirements. 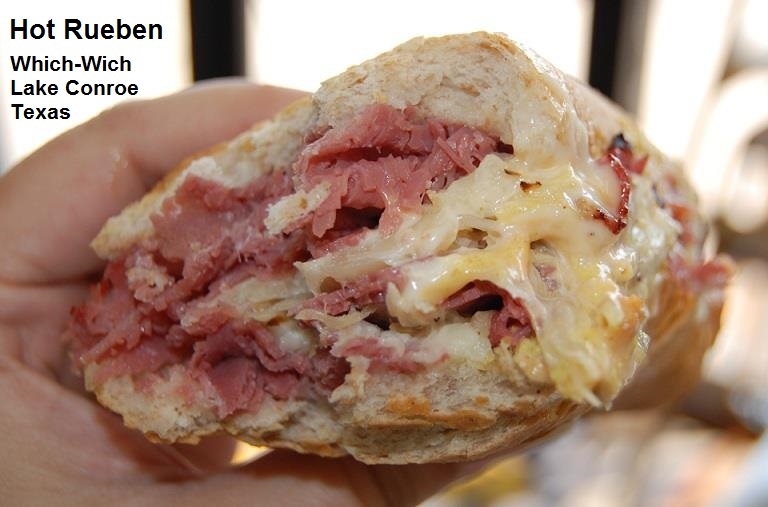 The two recipes below are bacon-based palate pleasers! Slice your croissant in half as a base for the sandwich. Apply condiments to taste. Layer on remaining ingredients as you prefer. Insert two toothpicks, one on either side, and slice in half. Enjoy. NOTES: Why anyone would want to pile more salt on top of the sodium in the meats is beyond me, but some folks prefer a lot of salt. For this sandwich, I prefer fluffy scrambled eggs held together by a slice of cheddar or Swiss above and below, a brown mustard, and sliced pickle instead of tomato. The suggested condiments are all right, but not to my personal taste. My partner on the other hand, loves yellow mustard and black pepper. The prep time for doing two to four of these sandwiches is not noticeably different. Not only are they great for a fairly quick breakfast, they are also a delicious addition to the brunch table. Pre-heat oven to 350F. Prep a baking sheet with either parchment paper or baking spray. Unroll the dough onto a flat surface with the cinnamon side up. If the rolls do not separate during this process, cut them apart gently. Lay 2 slices of bacon along each strip on the cinnamon side. Re-roll each strip of dough, maintaining the bacon along one long edge of the dough. Place the bacon rolls flat side down on on the prepared baking dish. Bake 16-20 minutes or until the dough is golden brown. Remove to wire rack and let stand for five minutes. Glaze the rolls with icing while still warm. Let stand until glaze is set. Serve warm. NOTES: Make sure you have 2 slices of bacon per roll noted on the packaging – some packs of cinnamon rolls contain 6 rolls, while others may have 8 or 10. Adjust your recipe accordingly. Whip an ounce or two of cream cheese with the icing from the package, or just spread cream cheese instead of the sugar for a less sweet breakfast roll. When using the cream cheese by itself, you might consider adding a dash of chili powder to the roll before adding the bacon, or dried or fresh herbs for a more savory presentation. I prefer to cook the bacon, drain and pat it dry of excess grease. Beef bacon as well as pork bacon both go well with this recipe. I have not tried it out with turkey or tofu based bacon products. I had to learn the hard way that breakfast really was a good way to start my day. In making it a practice, however, I find myself with more energy and have actually lost a few pounds over the last year – without really trying. You might give it a shot if you don’t already eat breakfast in the mornings and see how you feel after a week or so. Take a little bit of stress off your holiday preparations by being ready to take care of your family before and after the big day. These hints might help, or spark your own ideas on making things a little easier in the host’s home. The holidays are not only stressful for you, they can also stress out your pets. Set up safe zones for your animals where visitors are not allowed. This gives Fluffy or Rover a place to go when the family gets too loud or boisterous. Make sure their feeding stations are ready for them and don’t allow their schedules to be interrupted if it can be helped. Your companion animals rely on you for their maintenance and holidays are no exception. Be prepared for accidents caused by all the excitement, be it spilled water or an accidental piddle puddle. With all the cleaning, decorating, and food preparation that’s going on, take a beak from it all on the night before your gathering. Have a pizza night, or Chinese takeout. You don’t have to cook anything extra – let someone else take are of that! You don’t have to worry about plating, and cleanup is quick and easy. The day after Thanksgiving or Christmas is a time for hot coffee or cocoa, relaxing a bit, and finding inventive ways to use up those leftovers. 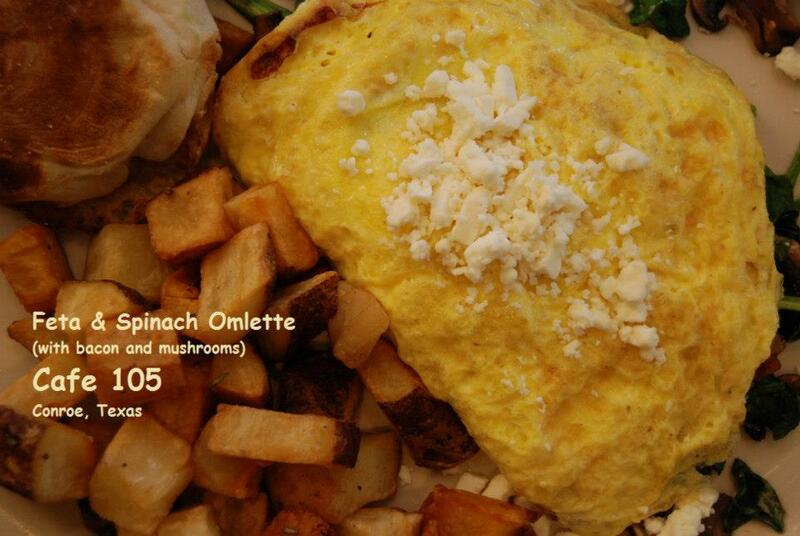 A breakfast suggestion is a sort of pizza. Use a flatbread like naan or even a flour tortilla as the base. Top it with shredded turkey or ham, cheese, sliced mushrooms, even a fried or scrambled egg. Bake just long enough to heat everything up and melt the cheese. for a rustic touch, sprinkle with freshly chopped parsley or scallions. If you want to get truly decadent, add a dollop of sour cream. I hope these tips help you enjoy your holidays with a little less stress and more laughter and gaiety. This lovely island surprise is located in an old light blue building on Broadway. Don’t blink or you might miss it, which is apparently what a lot of Galveston visitors do. 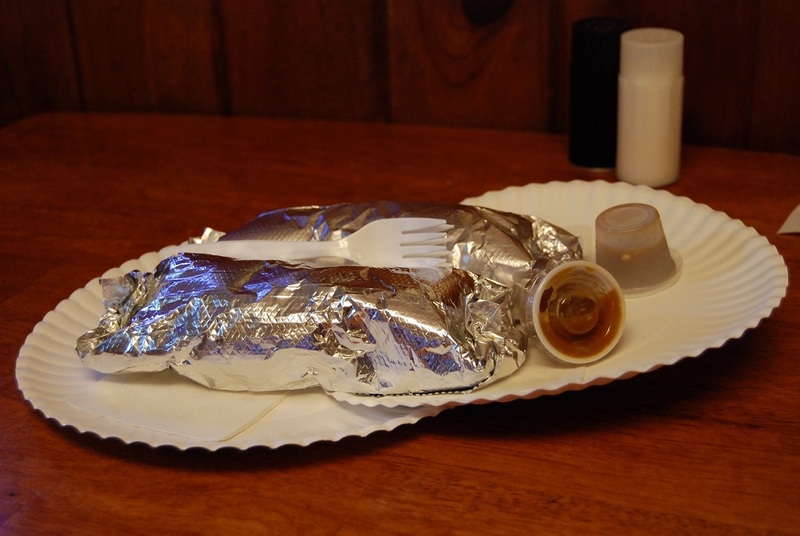 Bronco Burritos is a small business that packs a large punch, right in your breakfast noms. The burritos are huge, well packed, and so fresh you will think they are collecting eggs from hens in the back yard. There were a lot of work trucks parked outside, with electricians and plumbers and landscapers ordering to go, or if they had time sitting down in the tiny dining area to chomp their burritos. We chanced to visit with some friends who live on Galveston Island a few weeks back. It was the height of the chicken-flu, and the restaurant had postings everywhere (even on the receipts) apologizing for the temporary price hike due to the price of eggs. Very nice of them not to surprise you with it at the very end like some places have been doing. The price difference was maybe 20 cents per burrito, so it wasn’t too horrible. My partner foodies and I all ordered variation of the Bronco Burrito, the restaurant’s signature menu item. I subbed extra bacon for sausage and wheat tortillas. As you can see, it was still a monster. 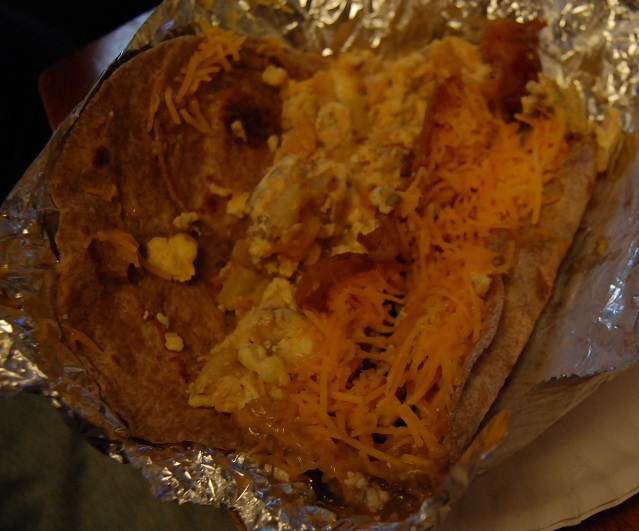 The Bronco normally has 2 eggs, potatoes, bacon, cheese, refried beans and chorizo. Not a small meal. You may customize as I mentioned, including things like wheat tortillas, all egg whites, and additional veggies. They also offer burritos with barbacoa, carne guisada, machacado, and migas. Burritos aren’t the only items on the menu at Bronco. 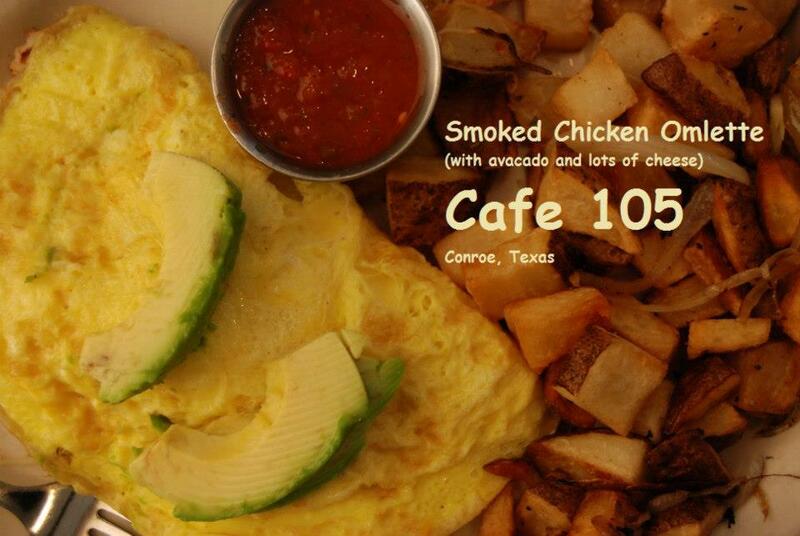 The have a variety of breakfast plates including machacado, pork chops and tamales. The tamales a la carte or on my hit list for our next visit. Each order is accompanied by a little pot of salsa. Watch out for this. It’s a bit warm for my tastes, but I like spicy salsas. It’s brownish with lots of tomatillo. 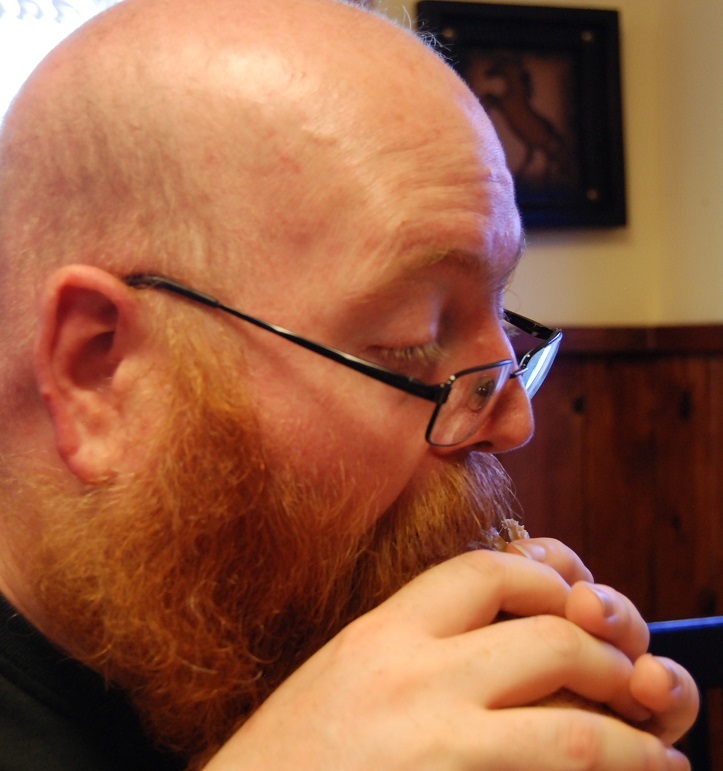 The heat seems to be mostly from jalapenos, but there could be something more. To give you an idea of how popular this place is, we visited on a Tuesday, and there were more than 30 orders placed (mostly to go) during our 45 minute visit! 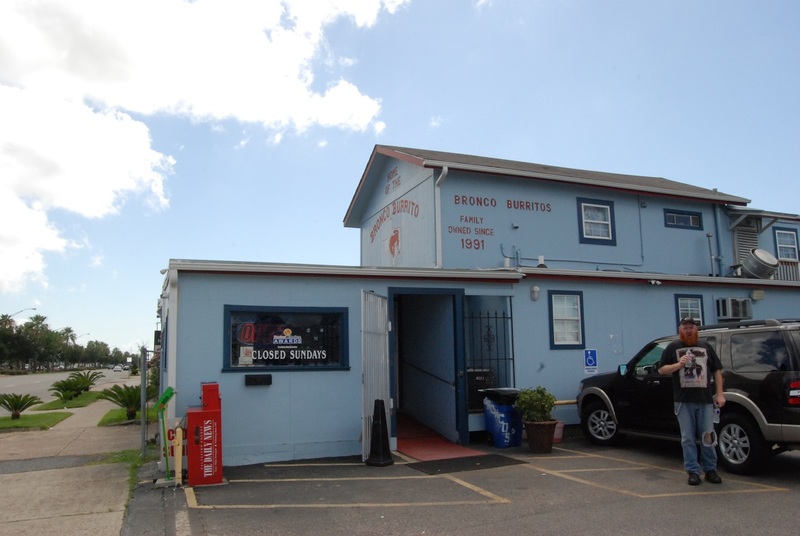 This place get a definite thumbs up, and revisits as often as possible. Remember, however, that they are closed on Sunday. I pulled a few photos from an album I started on Facebook a few of years ago. the food photos were, as they have been in this series, culled from stock photography. They were previously marked with where they were taken, in case you find any of them interesting enough to track down and sample. 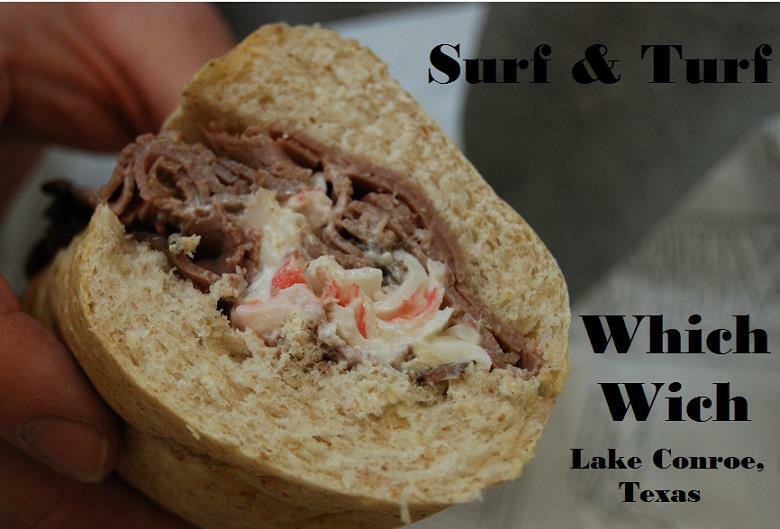 The following temptations were photographed at two restaurants in the Conroe, Texas area: Which-Wich and the 105 Cafe. While Which-Wich is a chain of tasty sandwich offerings, the 105 Cafe has been covered in this blog previously. Check it out here [insert link to blog entry]. Kroger had an interesting “Free Friday Download” recently. It was for a box of a newly released Idahoan brand potato side dish. These items are made with 100% Idaho potatoes, and need milk and butter added in most cases. They bake in the oven and are well worth the effort from our recent experience. We got to sample the Steakhouse Cheesy Hashbrowns. 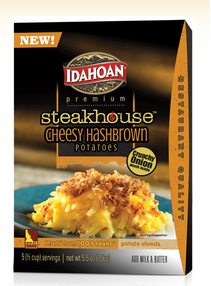 The website says, “Idahoan Steakhouse Cheesy Hashbrown Potatoes start with world-famous Idaho® potato shreds in a premium cheese sauce, then finish with a real crunchy onion topping! These Steakhouse Cheesy Hashbrown potatoes will add premium restaurant quality flavor to any meal.” I find I agree with their statement. 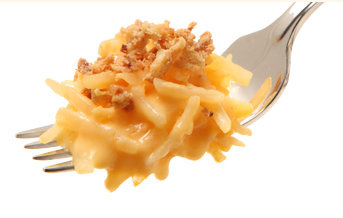 The cheese sauce came out creamy and very cheesy, keeping the whole moist without being soupy. 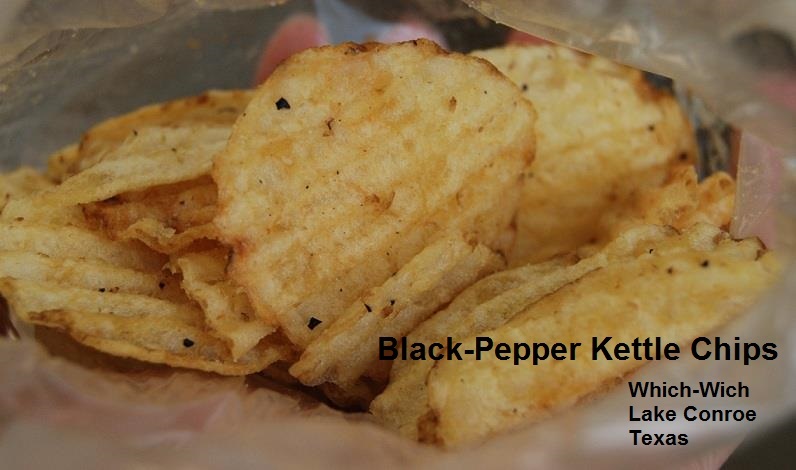 The dried hash-brown style potato strips re-hydrated evenly offering a solid potato texture. 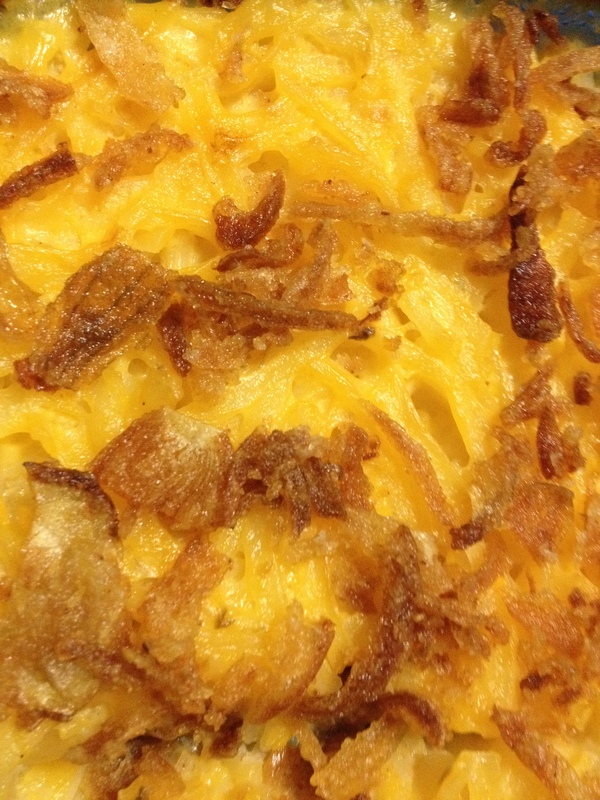 The crunchy onion bits that serve as an included topping were a lovely addition to the “casserole”. We served the dish as a starch alongside scrambled eggs with a touch of salsa. Actual dish from our kitchen. The box claims that it will make 5 half-cup servings. We made it into four servings with ease. While this might not be the best thing to do with a controlled diet, in my case for a diabetic, but it was definitely tasty! While I rarely fiddle with a pre-made dish on the first try, we did determine that adding extra cheese is never a bad thing. Cheddar of any kind or a Gouda would add a nice flavor contrast to this dish. Keep in mind that the crunchy onion topping is a trifle sweet. That’s not a bad thing, but it is good to know when picking out other items to serve with these potatoes. Actual dish from our kitchen. Next time, we will be adding Gouda! Who doesn’t like a fresh muffin on a cool morning, hot out of the oven, maybe with butter or cream cheese stuffed inside to melt? Here is a recipe that makes fruity muffins simple and satisfying. 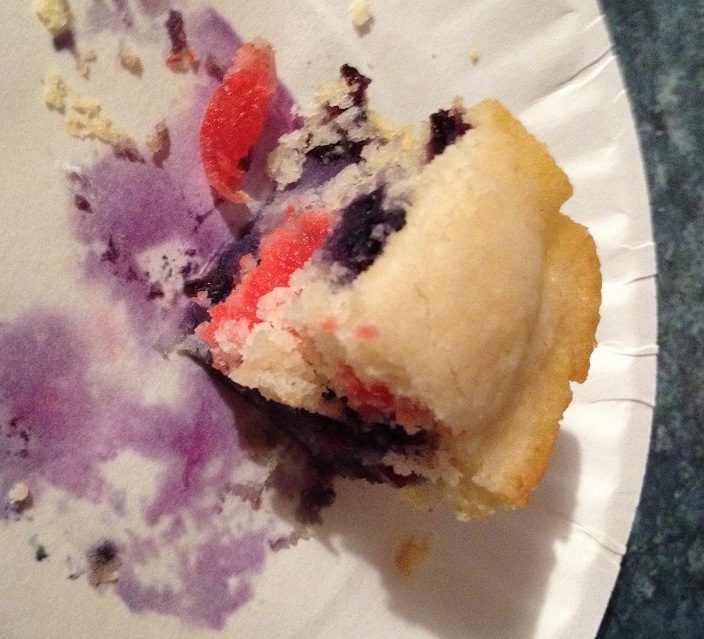 I stole it from my daughter after trying her muffins! In separate bowl combine wet ingredients. Fold dry into wet until thouroughly mixed. Spoon into greased or lined muffin tins. Bake approx 10 minutes or until golden. For a lemon variation add 2 teaspoons lemon zest and 2 teaspoons lemon juice (or more to taste) to wet ingredients. The pictured variation is blueberry, lemon, and chopped maraschino cherries with a half tablespoon of the cherry juice. Crushed pineapple may also be added for a different taste sensation. A variety of berries may be substituted for the blueberries, or added to them. Strawberries, dewberries, and blackberries are all tasty variations. With so many possibilities, how can you go wrong? 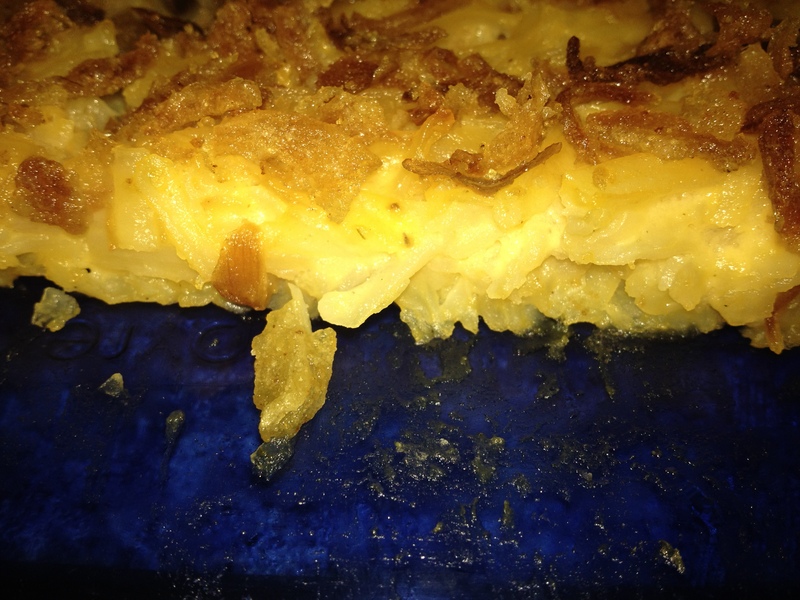 A delightfully variable recipe came into my kitchen from a family reunion a few months ago. It’s taken all this time for me to try it out, and I’m sorry I waited! The concept is simple – set it up the night before, so that it is hot and ready when you wake up the next morning. It’s great for parties when folks stay over, family gatherings, and for kid’s sleepovers. With the kids, it can be a great group activity to set up the meal. Layer 1/3 of hashbrowns evenly into the bottom of the crock pot, 1/3 bacon bits, 1/3 salsa and 1/3 of cheese. Repeat twice, ending with cheese. In a separate bowl, scramble eggs and milk. Add salt and pepper. Pour mixture evenly throughout the crock pot. Cover and cook overnight 8-10 hours. Serve! Of course, my partner in food and I could not leave this alone. Noticing the similarity between this recipe and a quiche (which we love and play with regularly), we picked up fresh eggs and cubed ham. Everything else needed was already in the kitchen. We dutifully layered the hashbrowns, ham, and an excessive amount of cheddar into the pot, skipping the salsa for this first experiment. The eggs got a nice uplift of season salt, garlic and dill. We decided the salsa would be better if served cold and crisp on top of the hot and lovely casserole. Two more friends joined us the next morning for breakfast. As we cracked the seal on the crock pot, the captivating aroma of melted cheese wafted playfully about the kitchen. Our attention, all four of us, was instantly riveted on the food. We served up the gooey stuff from the crock-pot with a sprinkle of yet more cheese, a bit of salsa (hot sauce was also available), and, as if the cholesterol content wasn’t bad enough, a side of bacon. This was a wonderful nosh! The possible variations for “next time” was the primary topic of conversation in between mouthfuls and moans of foodie pleasure. Ham, sausage (pork, Italian, sage, chicken, etc. ), crumbled bacon, and shredded turkey were all offered as possibilities for the meat ingredient. The cheese might need to be adjusted to compliment the meat, such as Mozzarella with Italian sausage, or Swiss for turkey. Including the salsa in the crock-pot will give a nice flavor, though I personally prefer using as a condiment rather than a spice. The “salt and pepper to taste” is an excellent base spice choice. Our use of garlic and dill rather than pepper gave the dish a mild flavor, enhancing the cheese rather than taking over. Spicing to match the meat/cheese combination is the way to go. Experiment with this “super-quiche” and let us know what you come up with!